We judged each dish on flavor, practicality, and creativity—here’s this year’s tried-and-true staff favorites! 1. Cook bacon in a large Dutch oven over medium heat 5 minutes or until browned. Stir in 2 cups onion; cover and cook until onion is tender (about 5 minutes). Uncover and stir in garlic; cook for 1 minute. 2. Increase heat to medium-high; add turkey and sirloin to pan. Cook 5 minutes or until browned, stirring to crumble. Add beer; cook until liquid is reduced to 1/3 cup (about 7 minutes). Stir in chili powder and next 5 ingredients (through tomato sauce). Cover, reduce heat, and simmer 30 minutes or until mixture thickens. Stir in beans; cook 10 minutes or until thoroughly heated. Ladle 1 cup chili into each of 6 bowls. Top each serving with 4 teaspoons cheese and 2 teaspoons onion. Serve with crackers, if desired. It doesn’t get much more Irish than this dish from Cooking Light, Beef and Guinness Stew! Guinness Stout and St. Patrick’s Day, go figure! This hearty beef stew is made with lean boneless chuck that’s cooked with carrots, parsnips and turnips and flavored with dark beer. Simmering it in a Dutch oven for about 2 hours makes the meat and vegetables fork tender and delicious. From the Cooking Light website…. Note: The original reader recipe called for low-calorie margarine; we updated it with butter for a smoother, richer taste. Lightly spoon flour into dry measuring cups; level with a knife. Combine flour, 3 tablespoons granulated sugar, baking powder, and salt in a bowl; stir with a whisk. Cut in butter with a pastry blender or 2 knives until mixture resembles coarse meal. Combine 1/2 cup milk, vanilla, and egg white in a bowl. Add milk mixture to flour mixture, stirring just until moist (dough will be soft). Turn dough out onto a lightly floured surface. Sprinkle surface of dough with dried currants. With floured hands, knead 4 times or just until the currants are incorporated. Pat dough into an 8-inch circle on a baking sheet lined with parchment paper. Cut dough into 12 wedges, cutting into, but not through, dough. Brush 2 teaspoons milk over surface of dough; sprinkle with 2 teaspoons turbinado sugar. Bake at 425° for 17 minutes or until golden. Serve warm, or cool on a wire rack. Started off the morning with some Simply Potatoes Hash Browns and a couple of Jennie – O Turkey Sausage Breakfast Links and a cup of Bigelow Decaf Green Tea. 12 degrees this morning but little to no wind chill. Mostly sunny but more snow coming in Sunday. Ran an errand for Mom and stopped off and got my Saturday Night Lotto Tickets. I’ll buy a couple every now and then and watch the Ohio Lottery Show on Saturday Evening. 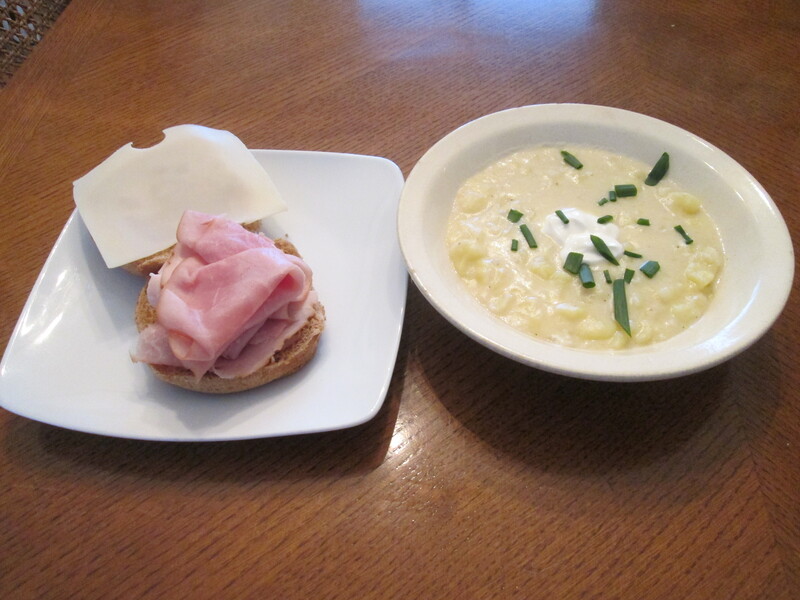 For dinner tonight a new recipe, (Home Made) White Cheddar and Chive Potato Soup w/ Ham Sandwich. 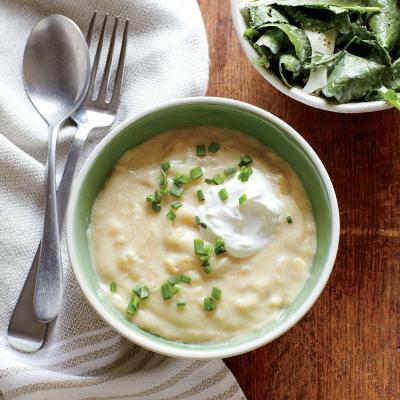 Came across the White Cheddar and Chive Potato Soup Recipe in an issue of Cooking Light. I love a good Thick Potato Soup. Actually Campbell’s Chunky Baked Potato with Cheddar and Bacon Bits is my favorite Potato Soup. So when I came across this one it seemed like a winner, and it was! The recipe calls for; 1 tablespoon Extra Virgin Olive Oil, 1/3 cup chopped Shallots, 2 Garlic Cloves (minced), 2 tablespoons All-Purpose Flour, 3 1/2 cups chopped Yukon Gold Potatoes (about 1 pound), 1 3/4 cups 1% Low-Fat Milk, 1 1/2 cups Organic Vegetable Broth (such as Swanson), 3/8 teaspoon Kosher Salt, 1/4 teaspoon Black Pepper, 2 ounces Sharp White Cheddar Cheese (shredded about 1/2 cup), 1/3 cup Fat-Free Sour Cream (divided), and 2 tablespoons minced fresh Chives. To prepare it heat a medium saucepan over medium-high heat. Add oil; swirl to coat. 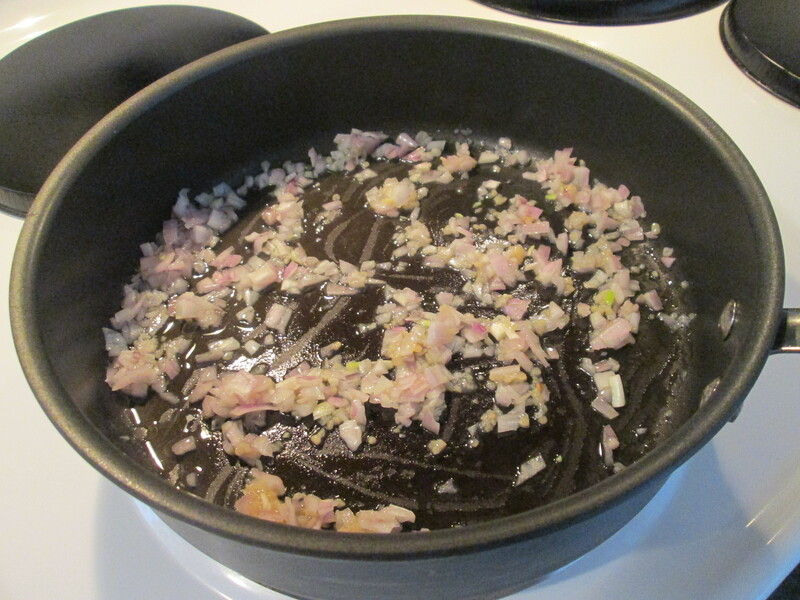 Add shallots and garlic; sauté 1 1/2 minutes or until tender. Sprinkle flour over pan; cook 1 minute, stirring constantly with a whisk. Add potatoes, milk, broth, salt, and pepper to pan; bring to a boil. Cover, reduce heat, and simmer 10 minutes or until potatoes are tender. Remove pan from heat. Mash potato mixture with a potato masher to desired consistency. Stir in cheese until melted. Stir in 1 tablespoon sour cream. Place 1 cup soup in each of 4 bowls. Top each serving with about 1 tablespoon sour cream and 1 1/2 teaspoons minced chives and serve! Makes a delicious, thick, and chunky Potato Soup. If you like you can add some crumbled Jennie – O Turkey Bacon to it for even more flavor. Got one of those Keeper Recipes here. To go with the Soup I made a Ham and Swiss Sandwich. 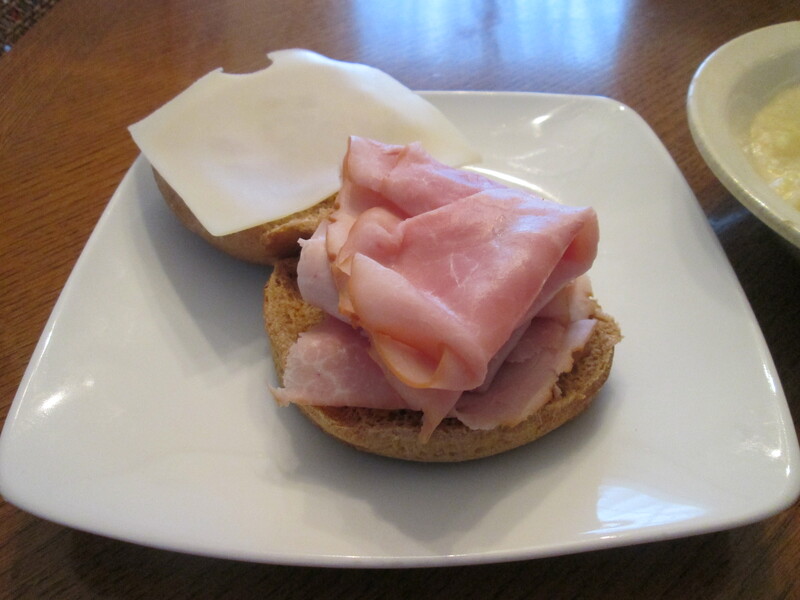 Using; Boar’s Head Smoked Honey Ham, Sargento Ultra Thin Swiss Cheese, Kroger Brand Whole Grain Hamburger Buns, and topped with Kroger Private Selection Sweet Hot Stone Ground Mustard. (my favorite Mustard.) For a dessert/snack later Organic Whole Grain Tortilla Chips with Simple Truth Organic Black Bean and Corn Salsa. 1. Heat a medium saucepan over medium-high heat. Add oil; swirl to coat. Add shallots and garlic; sauté 1 1/2 minutes or until tender. Sprinkle flour over pan; cook 1 minute, stirring constantly with a whisk. 2. Add potatoes, milk, broth, salt, and pepper to pan; bring to a boil. Cover, reduce heat, and simmer 10 minutes or until potatoes are tender. Remove pan from heat. Mash potato mixture with a potato masher to desired consistency. Stir in cheese until melted. Stir in 1 tablespoon sour cream. Place 1 cup soup in each of 4 bowls. Top each serving with about 1 tablespoon sour cream and 1 1/2 teaspoons minced chives. 2. Melt butter in a large stockpot over medium-high heat. Add onion, celery, black pepper, salt, and mushrooms; sauté 4 minutes or until mushrooms are tender. Add sherry; cook 1 minute. 3. Weigh or lightly spoon flour into dry measuring cups; level with a knife. Gradually add flour to pan; cook 3 minutes, stirring constantly (mixture will be thick) with a whisk. Gradually add broth, stirring constantly. Bring to a boil. Reduce heat; simmer 5 minutes, stirring frequently. Remove from heat. 4. Add 1 ¾ cups Parmesan cheese and cream cheese, stirring with a whisk until cream cheese melts. Add pasta and chicken; stir until blended. Divide pasta mixture between 2 (8-inch-square) glass or ceramic baking dishes coated with cooking spray. 5. Place bread in food processor; pulse 10 times or until coarse crumbs form. Combine breadcrumbs and ½ cup Parmesan cheese; sprinkle evenly over pasta. 6. Bake at 350° for 30 minutes or until lightly browned and bubbly. Remove casserole from oven; let stand 15 minutes. To prepare frozen unbaked casserole: Thaw casserole completely in refrigerator (about 24 hours). Preheat oven to 350°. Remove foil; reserve foil. Remove plastic wrap; discard wrap. Cover casserole with reserved foil; bake at 350° for 30 minutes. Uncover and bake an additional 1 hour or until golden and bubbly. Let stand 15 minutes. We gave these recipes a real workout: very satisfying food, very light. We’re not interested in low-calorie eating for low-calorie’s sake. The first principle is taste. But with so much fresh produce around, it’s a pure pleasure to cook this way. First up is our Tomato Tart. A summery spectacular, but also a creamy, cheesy calorie and sat-fat bomb. Ours is meat-free and cream-free, but olives add satisfying richness……. Fast-food chicken pies can contain 800 calories per serving. We deploy full-flavored chicken thighs and smoky bacon to add depth. Store-bought pie crust keeps prep easy…..
From the Cooking Light website, Basic Beer-Cheese Bread. Cheers! 2. Heat oil in a small skillet over medium-low heat. Add onion to pan; cook 10 minutes or until browned, stirring occasionally. Stir in pepper and garlic; cook 1 minute. 3. Weigh or lightly spoon flour into dry measuring cups; level with a knife. Combine flour, sugar, baking powder, and salt in a large bowl, stirring with a whisk; make a well in center of mixture. Add onion mixture, cheese, and beer to flour mixture, stirring just until moist. 4. Spoon batter into a 9 x 5–inch loaf pan coated with cooking spray. Drizzle 1 tablespoon butter over batter. Bake at 375° for 35 minutes. Drizzle remaining 1 tablespoon butter over batter. Bake an additional 25 minutes or until deep golden brown and a wooden pick inserted into the center comes out clean. Cool in pan 5 minutes on a wire rack; remove from pan. Cool completely on wire rack.